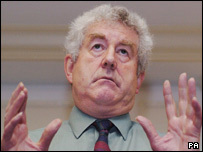 He baffled Jeremy Paxman with his views on one-legged ducks, and Rhodri Morgan still has the talent to bewilder. Wales' first minister won his second Plain English Campaign Foot in Mouth award for his comments on policing. He said: "The only thing which isn't up for grabs is no change and I think it's fair to say it's all to play for, except for no change." Mr Morgan first won when he asked BBC Newsnight host Paxman in 1998: "Do one-legged ducks swim in circles?" He is in distinguished company, as past winners include US Defence Secretary Donald Rumsfeld, the artist Tracey Emin and actors Richard Gere and Alicia Silverstone. Dave Smith, of the Plain English Campaign, said: "We hope he doesn't think that this is part of a personal vendetta. "Funnily enough, he won last time for the way he declared his wish to be leader of the assembly, which of course he now is." Mr Morgan made his 1998 "duck" comment when Paxman asked him if he planned to run for the leadership of the Welsh Labour Party. His latest award follows his contribution in the assembly on 15 November on the future of the four Welsh police forces. But Mr Morgan was clearly unfazed with the latest recognition of his verbal pyrotechnics. "I won this award before for my 'does a one-legged duck swim in a circle?' quote. In fact, it made my name. "Jeremy Paxman is still trying to work out whether there is a deeper meaning behind my proverb. This latest award is not quite in that class, so it must have been a thin year. "Nevertheless, I am delighted that the Plain English Campaign tunes in to the Welsh assembly every Tuesday for my question time waiting for another one-legged duck." The group's top award is the Foot in Mouth, with Golden Bull prizes going to other prime examples of perplexity. Alicia Silverstone won in 2000 for a newspaper interview about Clueless, the film which made her name, which she described as "very deep. I think it was deep in the way that it was very light. Campaign spokesman Ben Beer said while they were a bit of fun, "there is a serious point that jargon and waffle are still around and causing people problems. "Writing in plain English not only helps you to avoid an award for gobbledegook, it can help you save time and money by getting your message across clearly and accurately. Everyone has a right to clear public information." This year's Golden Bull winners include Halton Borough Council in Cheshire for a 630-word notice telling the public a footpath had moved.